IAC Acoustics Thailand is specialist and center for Asia for Audiometric Booths also called Audiology booth. We have a full range mini audiometric booth as well as full sized audiometric booths. 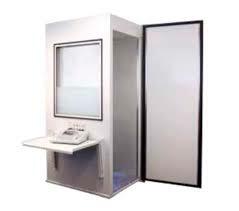 IAC has many types of audiometric booths, well respected by their sheer quality and competitive pricing. For more info about each of the units please click the links on the right. Size (internal): 604 x 860 x 1680 mm. Size (internal): 894 x 948 x 2000 mm.